Put a tablespoon of the oil in a saucepan and add the couscous. Fry for a couple of minutes until the couscous smells toasted, then cover generously with salted water. Bring to the boil and simmer for 6-8 minutes, or until the couscous is just tender. Using a colander or sieve, drain the couscous and transfer to a bowl. Stir in the red onion, lemon zest and herbs. Whisk the remaining tablespoon of oil with the lemon juice and season with salt and pepper. 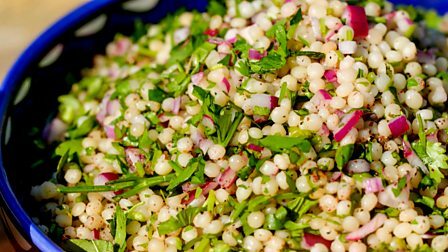 Pour over the couscous and, if using, sprinkle the sumac over the couscous. Mix well and serve hot or cold.